“Low-wage jobs,” “part-time work,” “employers cutting corners,” “fast food workers feeling squeezed” – it is not often that issues of precarious work get widespread and prolonged media and public debate. That’s just what has happened over the last few weeks as stories emerged of McDonald’s and other fast-food workers being laid-off in favour of migrant workers hired through the Temporary Foreign Worker Program. Unfortunately, rather than examining the structural causes of the shortage of good jobs and the growth of low-wage, precarious work – many fingers have pointed the blame directly at migrant workers. Among the flurry of media attention and growing discontent among the Conservative party’s anti-immigrant base, former immigration minister Jason Kenny, who now heads up Employment and Social Development, slapped a moratorium on new Labour Market Opinions for migrant workers in the food services sector. Absent from much of the discussion on the Temporary Foreign Worker Program has been the experience and voices of migrant workers, as well as the voices of solidarity from workers who are struggling in today’s job market. At the Workers’ Action Centre we run a phone hotline and speak to hundreds of workers each month. We speak to many workers who can’t pay the bills because they are earning minimum wage, while only getting part-time hours. We hear from workers who have been laid off and can only find work through temp agencies. We support workers who are facing unpaid wages and overtime pay to fight back. Many times, these are migrant workers who are owed massive amounts of money, but who could not speak up while they were on the job. The common thread across all of these experiences is that our job market has been changing rapidly and that it is harder and harder to find good-paying, stable work. 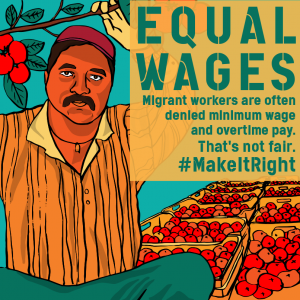 We see the rise of precarious work and migrant worker programs as part of the same low-wage agenda that aims to drive down wages and working conditions for all of us. It is no accident that the Canadian Restaurant and Foodservices Association (McDonald’s Restaurants of Canada is a board member) has lobbied for a minimum wage freeze and differential wages for students and liquor servers in Ontario, but also promotes temporary foreign worker programs that currently have little oversight over working conditions and tie workers to one employer. Similarly, it is not a coincidence that the Ontario Federation of Agriculture and several growers associations not only oppose the new $11 minimum wage in Ontario, but are calling for a separate and lower wage for agricultural sector workers who are mainly migrant workers. When one group of workers is pitted against another, it makes it much easier to forget about the larger forces that benefit from the deterioration of wages and working conditions in the labour market. That’s why the Workers’ Action Centre works to raise the floor of standards for all workers, including migrant workers. It’s also why we work hard to look for common ground across all of our members’ experiences and build solidarity and alliances to fight together for decent work. What does it mean to suddenly shut out migrant workers from food sector jobs with no path to permanent immigration status? It means that migrant workers who have taken out massive loans to pay recruitment fees abroad and who are waiting for a decision on their applications will be left with no option for work and their entire families in debt. It means that many migrant workers who are currently working in restaurants and who want to switch jobs because of labour rights violations will no longer be able to do so. It also means that many migrant workers who are here in Canada waiting the results of existing applications will face deportation. Essentially the result will be to penalize migrant workers instead of addressing the broken immigration system that shapes how people come to Canada to work.